Twelve young ospreys taken from nests in Scotland have been released in northern Spain, in an attempt to restore a breeding osprey population in the Basque Country. The Spanish authorities asked Scottish Natural Heritage (SNH) for assistance with the project last year. The birds came from the Highlands and Moray after Scottish Natural Heritage issued a special licence. 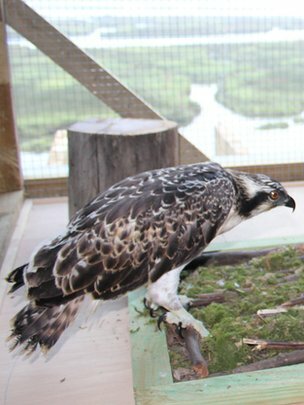 The young ospreys were said to be “faring well” in their new home. The birds were released at the Urdaibai estuary, which is used by ospreys migrating between Scotland and West Africa in spring and autumn. They have been provided with nest platforms and a supply of food, although at least one has now begun catching fish for itself. The special licence was issued to naturalist Roy Dennis, of the Highland Foundation for Wildlife. The project follows what conservationists say was the successful reintroduction of ospreys to Andalucia in southern Spain, which involved birds taken from Scotland, Germany and Finland. In 2008 the first pair to breed there were identified as a Scottish female and German male. There are now 13 breeding pairs of ospreys in Andalucia.